The 16th Annual Hillcrest Mardi Gras celebration returns on Saturday, February 10, 2018 with revelers embarking on an all-new neighborhood-wide Party Bus Bar Hop! The spirit of the French Quarter is taking over Hillcrest- so break out your masks, unleash your hidden sensuality and revel in your most, daring, and creative Mardi Gras costumes while you enjoy-- no cover, and priority admission to Hillcrest's best bars, clubs, and music venues! The All-Inclusive Mardi Gras Party Pass gives revelers an opportunity to sample cocktails at participating retailers, and restaurants, drink specials, collectible beads, doubloons, giveaways, and special offers at bars, nightclubs and live music venues! Revelers also get free parking and exclusive access to hop on/off any one of the five "Party Buses" at one of the seven themed "Party Stops!" Revelers can explore every party bus and hop on or off - as often, and as many times - as they want from 7pm-11pm! Participating bars, nightclubs and businesses will form a "Krewe" and will compete to deck out their roaming party bus. Each will feature drag queens, entertainment and special guests who's only objective is to entertain you in the most decadent and flamboyant way possible-- as you explore and visit as many participating locations as you can! Come dressed in your most festive attire for a chance to become KING or QUEEN of Hillcrest Mardi Gras! Party Stops will feature vendors, street performers and buskers that will entertain the crowds! Each stop is themed after a major New Orleans landmark such as: Bourbon Street Party Stop, The French Quarter Party Stop, The Garden District Party Stop, Royal Street Party Stop, The Voodoo Courtyard Party Stop, Southern Decadence Party Stop, and The Frenchmen Street Party Stop. 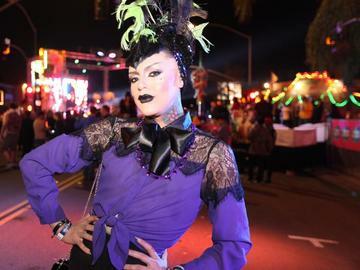 Nicknamed the "Southern Decadence of California" - Hillcrest Mardi Gras is the Nation's Largest LGBT Mardi Gras Celebration Outside of New Orleans. First 300 Party Passes are just $10 and will increase to $15 at 12:00am on Saturday, February 10th or once they run out. Purchase your tickets early- they are guaranteed to sell out! Free parking information and a full weekend schedule of events is available below! Please note the information and participating locations below may change- your party pass will include a map with all final participating locations! Bourbon Street Party Stop: located at the intersection of Third and University Avenue and featuring Pole Dancer: Nadine Young! Urban MO's Bar & Grill: No Cover, Express Entry, Cotton Candy Malibu Welcome Shot, Collectible Beads! Fiesta Cantina: No Cover, Express Entry, 2 for 1 Happy Hour Drinks, Collectible beads, Collectible rings for first 300 people, and a raffle ticket to win a Jager Snowboard that will be raffled off on Feb 22nd. Subterranean Coffee House: 15% Off All Night Long- Beads with Promotional offer. Dr. Bronners: Promotional giveaways, samples and more! Southern Decadence Party Stop: located in front of The Loft and featuring LED hopper-Alissa Kennedy! The Loft: Mardi Gras Welcome Shot, Happy Hour Pricing All Night! Sapore: 10% Off Dinner & Drinks on Saturday Feb 10th, & Special Beads with 10% Off Coupon for future visit! French Quarter Party Stop: located in front of Babycakes! Brass Rail:No Cover, Express Entry, Shot Special, Beads! Babycakes: No cover, Express Entry, $5 Hurricanes, Beads! #1 Fifth Avenue: $3 Domestic Beers and $3 Well Drinks! Royal Street Party Stop: located in front of Rich's/Flicks! Flicks: No Cover, Express Entry, $5 Hurricane in a commemorative cup, beads & masks while they last! Rich's: No Cover, Welcome Shot for first 300 people, collectible beads, 50% off drinks 6pm-11pm! Voodoo Courtyard Party Stop: located at Uptown Tavern and featuring Sleeveless the Magician! The Merrow: No Cover, Express Entry, Drink Special! Gossip Grill: No Cover, Express Entry, Collectible Beads, Berry & Beads Welcome Shot! Uptown Tavern: Express Entry, $5 Pina Picante Drinks in a fun glass. Drink made with Tamarind vodka, pineapple, lemon and agave with a dust of ciinnamon. Garden District Party Stop: located at Pride Plaza! Grace Threading: Beads with FREE Service Promotional Offer! Baja Betty's: Beads, No Cover, Express Entry, Collectible Beads, Pacific Hurricane Welcome Shot! Brick Bar: No Cover, Express Entry, Welcome Shot, $7 Tito's MULES and Cosmos and Collectible Beads! Hillcrest Brewing Company: Beads, No Cover, Express Entry, Collectible Beads, Blue Ball Welcome Shot! Frenchman Street Party Stop: located Pardon My French and featuring Scarlet Checkers Contortionist performing! Pardon My French: Stoli Ruby Red Slipper Welcome Shot, $5 Hurricanes, Beads! Hillcrest Mardi Gras benefits the programs and services of the Hillcrest Business Association, including neighborhood sidewalk cleaning and steamed power washing, trash collection, neighborhood gardening and landscaping, and maintenance of the Hillcrest Pride Flag. Attendees must be 21 years or older and have a valid photo ID to enter. Will call will be located at the Hillcrest Pride Flag. If you are interested in sponsoring a Hillcrest Mardi Gras Krewe Party Bus, Ball, Party, or becoming a vendor, or if you would like to volunteer with the event please contact the Hillcrest Business Association, Marketing + Member Services Director, Eddie Rey at eddie@hillcrestbia.org or call (619) 299-3330. PARK FREE AT THE DMV!